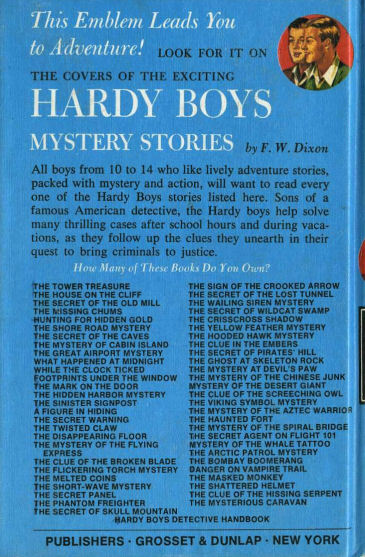 Although the front cover justifiably gets the lion's share of attention, the back covers of the Hardy Boys books have evolved over the years, and can be a useful tool for quickly narrowing down the printing date. 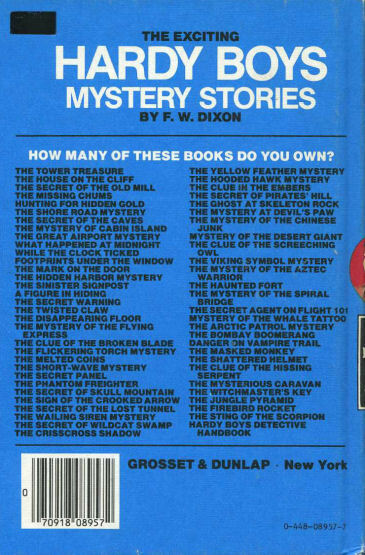 Dust-jacket editions featured a variety of back covers, usually displaying advertisements for other Grosset & Dunlap series (frequently Tom Swift Jr. in later years). I hope to post some scans at a later date. 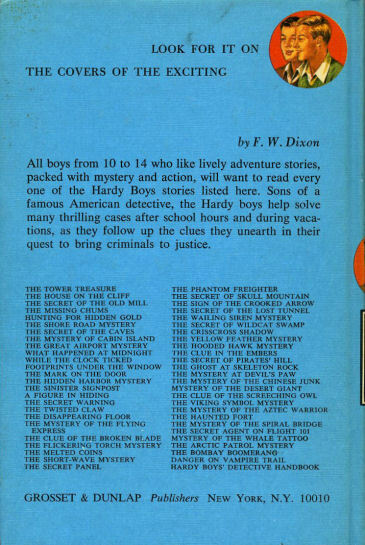 After the publisher switched to "picture cover" (pictorial cloth) format in 1962, the back cover was dedicated to a list of volumes in the Hardy Boys series. The list was updated fairly regularly as new volumes were published. Around 1971-72, some Emblem covers were printed without the white lettering. These editions are scarce. A late variation of the Emblem cover occurred around 1975, when the font used for the title list was changed to a bold sans-serif font. 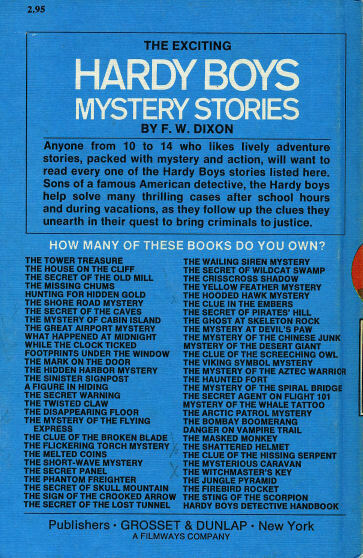 The second major back cover design, adopted around 1976, is the "Exciting" cover. In this design, all of the text is set in sans-serif type. 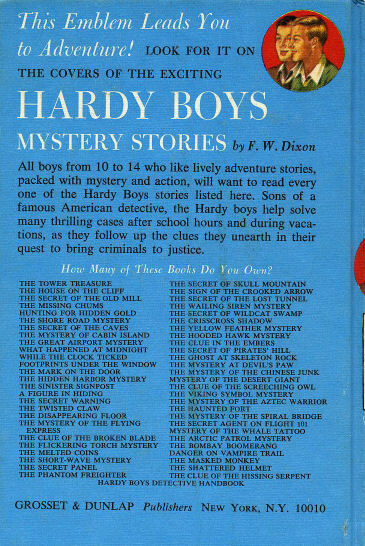 Note that in the blurb, "All boys" has been changed to the gender-neutral "Anyone". 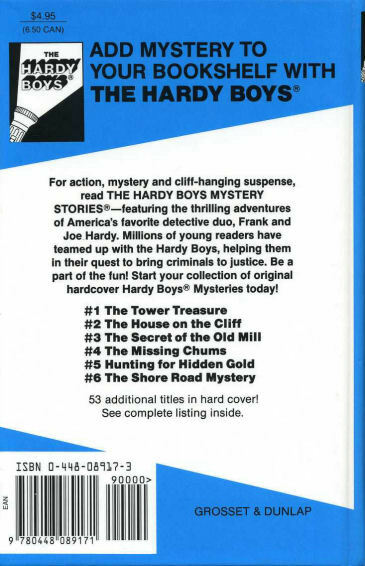 A simplified version of the "Exciting" cover, with the blurb removed, came into use in the early 1980s. The font has also been changed; compare the front leg of the "R" in "HARDY" with the cover above to see the difference between the two typefaces.